This piece first appeared in Byrd’s 1589 collection of Cantiones Sacrae to a Latin text, but it was later fitted to the present English translation, probably not by Byrd himself, however. 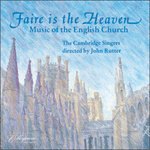 The music shows Byrd’s mature style at its most poignantly expressive; his choice of text is believed to be an oblique reference to the plight of the English Catholics and their outlawed faith. let thine anger cease from us.